If you are lucky enough for any reason to go to the Mayan, give yourself extra time to explore and enjoy it. Hang out in the upstairs lobby. Watch one movie, watch all three. It’s worth it. You will think you have died and gone to Movie Heaven. Once upon a time, out here in the West, there were movie palaces everywhere. Many of them were torn down — the Aladdin, the Centre, the Isis, the Denham, the Cooper, the Century 21, the Flick. Some were repurposed — the Gothic, the Oriental, the Federal, the Holiday (nee Egyptian), the Ogden, the Bluebird, the Paramount, the Atzlan, the Boulder. The Hiawatha became the Esquire, renovated and split in two. Only the Mayan still stands to remind us of the glory that moviegoing once meant to film lovers. 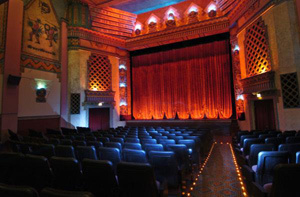 True, its balcony has been converted into two smaller cinemas — but the scale and scope of its original design is apparent. 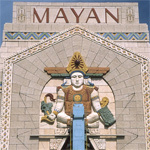 It was built in 1930, and remains one of only three extant examples of the Mayan Revival style in America. The bold figurations, unabashedly intense coloration, and gimcrack opulence make it an immortal venue. When I started going to movies there, it was already a dollar-movie joint, dank and decaying, with busted lights, broken seats, sticky floors and patrons who rolled joints in the back row and rolled empty beer bottles down the aisles to the stage, where they clanked or shattered. Still, we loved it (and it was all we could afford). Even now, budget-conscious patrons can still chow down cheaply at Senor Burritos or Famous Pizza before show time. The ambience of the neighborhood hasn’t changed much — the drunk and derelict still roam the sidewalks, although the classic 24-hour greasy spoon hangout Mary & Lou’s, from which no one was ever 86’d save for on-site murders, is long gone. The restored architecture and decoration wouldn’t mean a thing if the venue wasn’t well run. The staff is actually conscious, trained, polite, and helpful, and they love movies! It’s a miracle. The upstairs snack bar serves beer and wine, and both snack bars serve excellent sweet treats, crunchy salty snacks and other oddments. Landmark’s stock-in-trade is, by and large, quality cinema, what we used to call art-house fare. The discriminating filmgoer (read: snob) will find something worthwhile to check out here. Even if the movie doesn’t turn out to be all you hoped, the surroundings are lushly comfortable — steeply canted, soft seats; great sight lines; top-notch projection and sound quality. The two smaller screening areas are just dandy. If you can, though, see something in the main auditorium downstairs. The Mayan is showing big-screen-worthy flicks such as Sunrise and North by Northwest. This is how movies should be seen. Only two caveats: the restrooms, especially the downstairs ones, are hilariously cramped; time your visit in advance. Also, the on-street parking can be a chore (remember, the meters are in effect until 10 p.m.), and you MUST lock your car. Short of a rare screening at the Paramount prefaced with a Mighty Wurlitzer organ prelude, you can’t hope to have a better time at the movies in our area than here. Thirty-five years and hundreds of satisfied viewings make me the Mayan’s number one fan.